The organ of the former Premonstratensian Imperial abbey of Weissenau (today a district of Ravensburg) was built in 1787. Having 41 stops over three keyboards and pedals, it is one of the largest and most important 18th century historical organs in Southern Germany. Without doubt, the time J. D. Heinichen spent in Italy after 1710 when he came into contact with Gasparini, Pollaroli, Lotti und Vivaldi had a profound influence on his individual and innovative composition style. 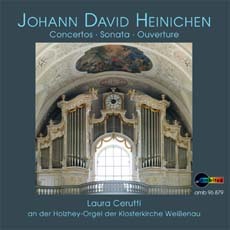 The orchestral concerts bear witness to this style; several of them have been arranged for the organ for the first time and recorded on this CD.